Using separate switches to operate a ceiling fan and light combination unit allows a user to operate one, or both, features without pulling on the ceiling fan's pull-chain switches. The wires delivering the ceiling fan and light's power supply, coming from a circuit breaker, enter the switches' electrical box, where a jumper wire supplies power to both switches. When one of the switches turns on, the electricity continues to the part of the ceiling fan it operates. When both switches turn on, both the ceiling fan and light turn on. Ceiling fan and light units can operate with two switches. Turn off the ceiling fan and light's circuit breaker. The correct circuit breaker often uses the room's name on its tag. Remove 1/2 inch of each wire's insulation in the switch's and in the ceiling fan's electrical boxes with wire strippers. Two wire sets enter the switch's electrical box: a wire set with two insulated wires (from the circuit breaker), and a wire set with three insulated wires that travels to the ceiling fan's electrical box. Both wire sets also contain a bare copper wire. Connect the wires in the ceiling fan and light's electrical box. Wrap the uninsulated wire from the wire set around the green screw on the ceiling fan's mounting bracket and tighten the screw with the correct screwdriver. Twist the ceiling fan and light's white wire to the wire set's white wire and lock them together with a wire nut. Twist the ceiling fan and light's wire with the "Light" label, usually colored blue, to the wire set's red wire and lock them together with a wire nut. Twist the ceiling fan and light's wire with the "Fan" label, usually colored black, to the wire set's black wire and lock them together with a wire nut. Twist the white wires in the switches' electrical box together. Lock them together with a wire nut. Cut two 6-inch-long jumper wires from 14-gauge insulated wire with wire cutters. Use wire strippers to remove 1/2 inch of the insulation from each end of the jumper wires. Wrap the bare copper wire from the ceiling fan and light's wire set and one of the jumper wires around the green ground screw on one switch. Tighten the ground screw with a screwdriver. Consider this switch No. 1. Wrap the other end of the switch's jumper wire and the bare copper wire in the wire set that connects to the circuit breaker around the second switch's green ground screw. Tighten the screw with a screwdriver. Consider this switch No. 2. Wrap the black wire from the circuit breaker and the second jumper wire around switch No. 2's gold-colored screw. 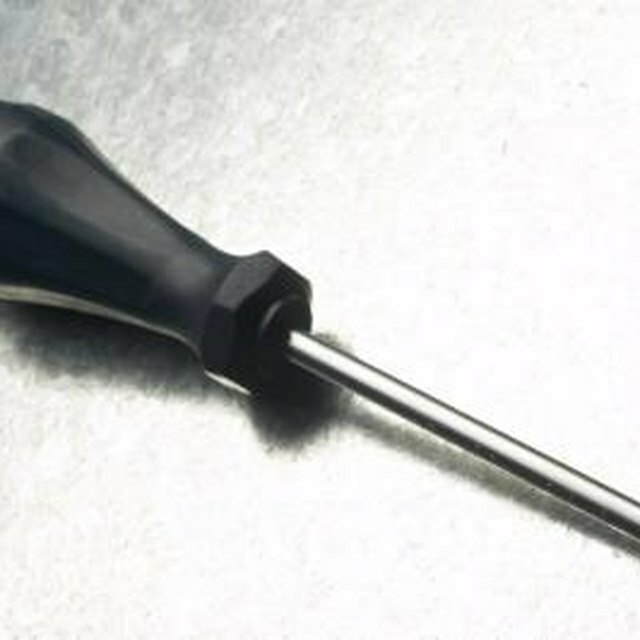 Tighten the screw with a flat-head screwdriver. Wrap the other end of the jumper wire around switch No. 1's gold-colored screw. Wrap the black wire from the ceiling fan and light's wire set around switch No. 1's silver-colored screw. Wrap the red wire from the ceiling fan and light's wire set around switch No. 2's silver-colored screw.